Rrrrrrraw psychedelic from one of the best contemporary Japanese bands. 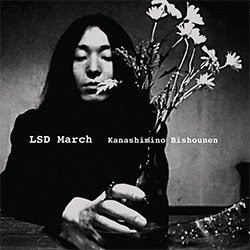 About: "Kanashimino Bishounen is the third album proper from LSD March following a pair of Japanese only releases on the Gyunne Cassette and White Elephant labels. These live recordings performed by the trio of Shinsuke Michishita (voice,guitar), Masami Kawaguchi (guitar) and Ikuro Takahashi (drums) feature five tracks that encompass a free form psychedelic approach to music that is inimitable in spite of its customary points of origin. Song structures are loosely pieced together and are distinguished by elevated guitar work and washes of glorious noise. The music is as expansive as it is destructive."